Adam Levine is the lead vocalist of one of my favorite bands, the Maroon 5. Almost all of their songs captured my heart and put important memories in my life. The latest in my track from them is "Daylight." He really looks like Adam Levine right?! 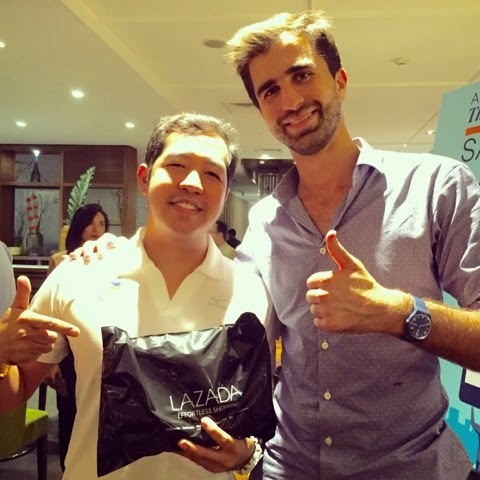 He is Florian Holm, one of the executives of Lazada. We met again for the second time around. Our picture above was during our recent Lazada event, the launch of their great mobile app sale , Tuesday night of May 19, 2015. We first met at exactly two months ago - March 19, my birthday which was also the third year birthday celebration of Lazada! What a coincidence!